Fancy finding yourself in the lap of luxury, surrounded by great shopping and a fab theatre district? 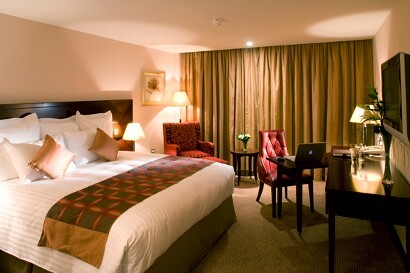 Then the Savoy Hotel in Limerick should be at the head of your list. From top to bottom, the Savoy exudes glamour and charm. Centrally located with all of Limericks sights and sounds right at the doorstep, it’s the perfect base from which to explore all that the city has to offer. Once you’ve got settled, head for the leisure centre where, if you’re the relax and pamper sort, you can enjoy an extensive variety of treatments to, as they would say, renew, replenish and restore your body and mind. However, for the more active folks out there, they offer complimentary access to their gymnasium and swimming as well as Jacuzzi and steam room facilities. When it comes to food and drink at the Savoy, you are more than covered. The Savoy Restaurant is as stylish and elegant as the rest of the hotel, and the menu there offers a great selection classic food with contemporary twists along with a selection of specialty wines from small vineyards around the world. Open throughout the day, it’s a perfect place for a romantic dinner, a meal with friends or even a formal get to together. Located just next door to the hotel is Hamptons Bar & Grill, a popular New York style restaurant featuring wood-fired Robata ovens and grills, designed to insure maximum flavour and juiciness when it comes to meats and seafood. Think a 10oz gourmet Bearnaise burger with sautéed mushrooms and fries, or maybe pan-seared sea bass with a roasted red pepper sauce and long-stem broccoli. At the end of your evening, or maybe the start, make your way over to the Savoy Hotel Bar for a drink. Famous for their premium and varied cocktail selection, the Savoy Bar offers a cool relaxed atmosphere and an inviting outdoor heated terrace and is ideal for birthdays, engagements, nights out or even just a quick drink. So, whether you’ve come to Limerick to sightsee, to shop, for a sporting event or a work trip, you’re not going to find better than the Savoy Limerick. So, don’t wait, book a room now and enjoy a real treat in the Treaty City.